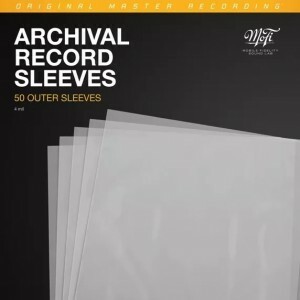 New alternative to inner sleeves, these are MFSL outer sleeves designed to keep your LP sleeves in pristine shape. MFSL (Mobile Fidelity Sound Lab) Archival-quality Outer Sleeves safeguards your vinyl LP record jackets from wear, scuffs and debris. Protect your record covers from damage, hair, and dust and keep your vinyl LP jackets in tip-top shape with our Record Outer Sleeves. Featuring 4ml thickness that affords stellar archival safekeeping as well as easy access on shelves or racks, these unsurpassed protective sleeves guard against scuffs, wear, denting, dirt, and all sorts of debris. They'll help keep your record jackets and the precious artwork and graphics that make vinyl far superior to any download or CD – in mint condition. Plus, they're sized just large enough to provide a close fit while allowing enough room to accommodate most gatefold jackets. An absolute necessity for any record lover and a no-brainer investment. Each pack contains 50 outer sleeves.